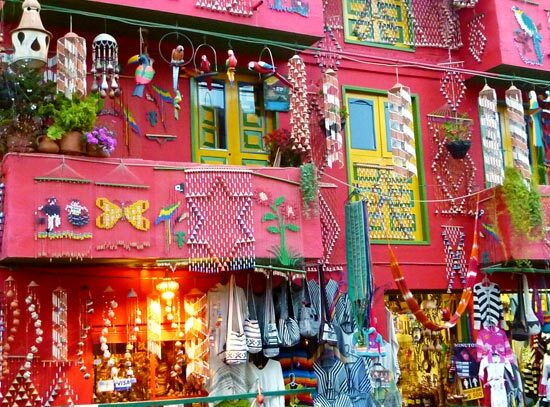 The small town of Raquira, about 25km (45 mins by bus) southwest of Villa de Leyva, is probably the most colourfully decorated town in Colombia. It's almost as if the local school children were one day given hundreds of paint and brushes and told to "have at it". There is barely a square inch of building in the town that is not awash with colour or artwork. 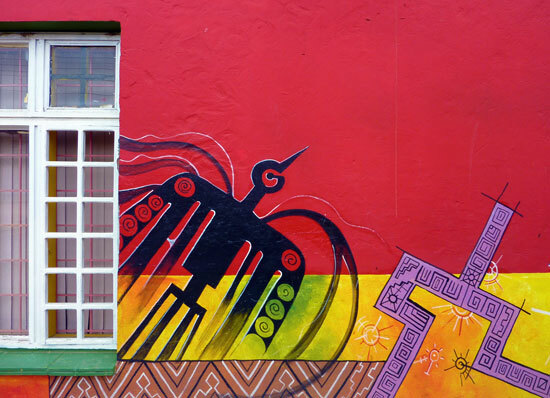 Many of the walls of the town's houses have been decorated with patterns and artwork which makes wondering around the place an enjoyable experience. But the locals' artistic talents do not stop at their buildings. The town is also an important centre for handicrafts, in particular pottery. 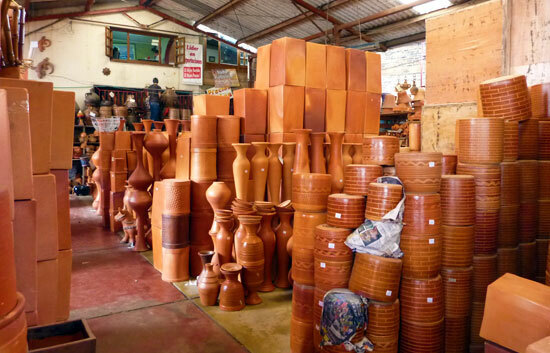 In fact the very name Raquira comes from the indigenous language of the Muisca Chibcha people and means "City of Pots". The town is smaller than nearby Villa de Leyva and has a population of around 2000. The central plaza contains several ceramic statues and is bordered by a small church. There are various cafes and restaurants around the plaza. The town is also full of shops selling ceramics and other handicrafts and woven products. Prices are fairly reasonable. You can also visit a number of ceramics workshops and observe how the pottery is made. The surrounding area is green and lush with a river skirting the edge of the town. The small roads are pretty quiet and, with care, provide a nice route to see the surrounding countryside. Not far away is the small village of La Candelaria, home to a monastery. Even in peak season finding accommodation is never a problem. I last visited during Easter Weekend and there were plenty of rooms available. Located on the road into town is Hosteria San Fermin, probably the best hotel in town. It has rooms for couples or larger groups and has a decent sized restaurant. Prices are around 35,000 pesos/person (depending on the season) and includes breakfast. If you don't mind staying just a few miles outside the town, try Hostal Silvestre Lodge, a charming hotel in the middle of some gorgeous countryside surrounded by woodland, lakes and waterfalls. Have a look at my guide to the delightful colonial town of Villa de Leyva, less than an hour away.